Ladies and gentleman, club-goers of all ages, it’s the greatest mashup party on Earth! 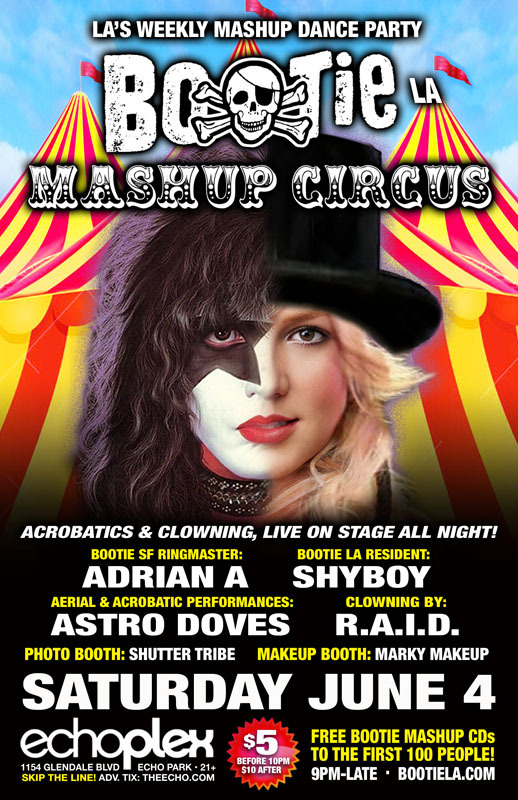 Bootie is always a Mashup Circus, but for this special night, we are taking it literally, with acrobats, aerialists, clowns, and side-show acts live on stage throughout the night. Only $5 before 10 PM! Acrobatics and clowning, live on stage throughout the night! Ringmaster Adrian A. joins resident DJ ShyBoy in the middle of the Big Top for a Mashup Circus, as the Astro Doves perform aerial and acrobatics thoughout the night, and resident dance crew R.A.I.D. clowns around on stage. Plus, Marky Makeup will be giving circus makeovers and Shutter Tribe will capture it all! Plus FREE Bootie mashup CDs to the first 100 people through the door!